I've got the blower fan mounted on the air assist mounting from Thingiverse (https://www.thingiverse.com/thing:2545095 - which I need to modify slightly) and the fan is connected to the top of the laser module. It is quite effective and there isn't any smoke damage on card or wood like before. If you want to connect the blower fan to the laser module as I mentioned in a previous post, make sure you take some ESD precautions when handling the module. The four screws are self tapping and go through the laser mounted fan to the metal heatsink. You don't want to undo these screws more than once, otherwise the threads in the heatsink will foul. The cable to the blower fan can be desoldered at the terminals on the fan body, cut down and resoldered, to shorten it. Ok, thanks. I've spent a few minutes reading about brushless DC motors, so I now know that they don't just run backwards with opposite polarity! This connection isn't really suitable for driving an air assist fan under all laser power levels, is it? Yes, I turned the laser on. I've found why the fan didn't work... I plugged the fan in the opposite polarity expecting it to go backwards and just swap the sockets in the connector later, however the fan doesn't work with the wrong polarity. I swapped the connector in the pins, tried the fan in the motor socket and it does work when the laser is on. I did remove the mana se board because I've got a fault developing in the x-axis driver. The motor connector goes to 12V on + and the - goes to the LR120N MOSFET drain (bottom right), so I assume this turns the laser on and off if you're using "TTL"? ~~I've just tried measuring the motor port with a CRO. Nothing but 0V followed by odd noise. I don't have access to a modern storage scope, just a Hameg HM400 at the moment. 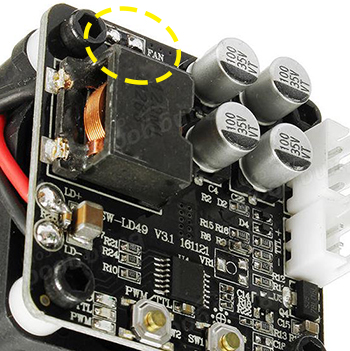 A question for other people - does the controller need some gcode to activate the motor port? I can't be bothered to take it all off to examine the traces, perhaps someone knows. Thanks.~~ See next message. I'll just go ahead and attach the fan to the fan terminals on the laser board, I think. I'm adding an air assist to a newer A3 pro with the blue laser module. Plugging the 12V fan into the motor port, I've found that it doesn't work even when the laser is on 100%. I'm about to have a look at what this port actually gives out when the laser is powered (anyone know? 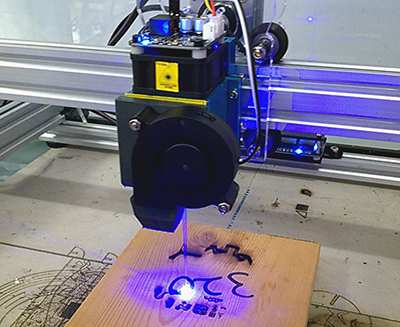 Is it the laser PWM? )(rubbish, see next message), but I'm actually considering soldering two pins onto the 'fan' connection on the board on top of the laser module and plugging the air assist fan in there - it provides 12V and doesn't require the lead to go back to the controller board.